"Earth Metal Bell Tie Back Tassel Pair" Accentuate your tapestry with this lovely long tassel with a forged metal top and a bell shaped drape. Overall drop is a generous 30 inches. Cording is braided and the long bell shaped tassel is dense, soft and luxurious. The earth shade is a mix of browns and chesnut colors. Includes 1 pair (2 tassels). 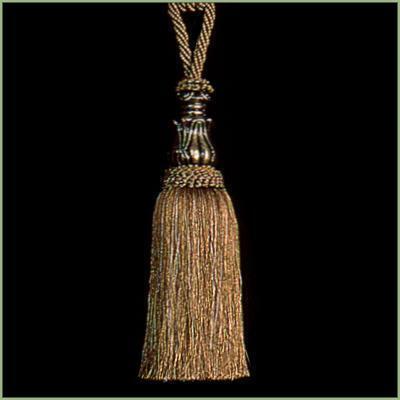 Tassel Width: 3 inches Tassel Length: 11 inches A traditional and versatile fleur-de-lis finial design in solid black. Small size range with telescoping width from 28 inches to 48 inches. Sturdy,versatile metal construction and easy to hang. Fleur-de-lis finial is 4 inches wide and 3.5 inches tall. PLEASE NOTE: Shipping ONLY within the continental U.S. **Hawaii, Alaska, and Puerto Rico residents must contact seller for shipping quote before ordering.